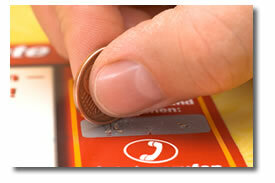 We offer a variety of Discount Scratch Off printing services to meet your needs and budget. - 2 Scratch Off ONLY on 4.25"x6"
4.25"x6" / 4"x9" / 6"x9" /6"x11"
On 4"x9" Scratch Off Cards, we DO NOT offer Oval Shapes as options. 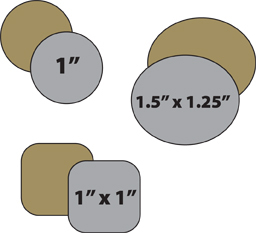 Only 1" Circles and 1" Squares are available for 4"x9" Scratch Off Cards. Scratch Off areas must run consecutive in a row going the long length of the card. If your design is something else, please advise so this can be priced as an additional cost for special Scratch Off placement. Scratch Off areas must be 1" apart and at least 1/4" from any outside card edge. The printed area underneath the scratch off must be 1/8" smaller than the outside dimension of the scratch off surface. On any Scratch Off Card that is a finished size smaller than 6"x9" (4"x9" or 4.25"x6"), the artwork and Scratch Off layout orientation must be going the long direction of the card.